Normally, when we report on a car recall, it's because the car in question had dangerous airbags, the windows that didn't close properly, or doors that might pinch the hands of tiny children. Today we have a more exciting (scary) recall to report. 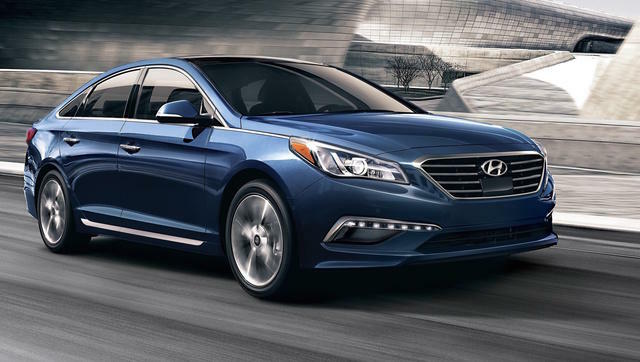 Hyundai is calling in 62,811 Sonata cars built between 2014 and 2016 because of a malfunctioning sunroof that can put you and other drivers at risk. CNET's Road Show first reported on the recall, discussing a domino effect of craziness that could create a really bad situation. Apparently, the wind deflector on the panoramic sunroof is prone to getting loose and messing with the moving parts of the actual sunroof and "causing a complete detachment of the glass panel." Yeah, that seemingly harmless wind deflector can possibly cause your entire panoramic sunroof, basically the roof of the car, to rip off while you're driving. Obviously, that's dangerous not only for the driver and passengers of the car, who might be shocked into driving it off the road or into something else but also for other drivers on the street. Imagine driving down the highway when the sunroof from the car in front of you blows off and comes hurtling straight at your car. That's terrifying, and scarier to think that about 62,000 of these cars are still driving around in the warm weather when sunroofs are still in use. Road Show said that Sonata owners can attempt to prevent that situation by making sure the wind deflector isn't getting loose. Just climb up on the roof and give it a jiggle, make sure there aren't any screws loose or anything like that. You should take your car in for repairs even if it's solid, but at least you don't have to worry about an impending situation. Your local dealer should be able to take care of the problem, which can apparently be mitigated by just not using the sunroof at all. Oddly, Road Show said that Hyundai notifications won't be going out until December, however, which means you might need to take action yourself before waiting for something official to arrive in the mail. Between exploding phones and flying sunroofs, I'm starting to think I'm better off never leaving the house.